Once again, we see several things happening at once. DNA is full of surprises, evidence shows the hand of the Creator's work, evolutionary scientists are surprised instead of seeing fulfilled predictions, and so on. As we keep saying, it's a great time to be a creationist, and I reckon it's only going to keep getting better. DNA studies are showing codes within the code; what was considered a redundancy (maybe like a back-up plan) turns out to have even more function. Evolutionary scientists need a bit more caution and humility before declaring things "junk" or giving them some other write-off because they don't fit into their evolutionary presuppositions. Discoveries of DNA sequence that contain different languages, each one with multiple purposes, are utterly defying evolutionary predictions. What was once hailed as redundant code is proving to be key in protein production. Proteins are made of strings of amino acids encoded in the protein-coding regions of genes. A previous discovery demonstrated the same three-sequence series of letters in the DNA that code for an amino acid (called a codon), can also tell specialized proteins that turn on genes (called transcription factors) where to bind to the DNA in the genome. However, a new discovery is attributing even more function to the sequences of codons and overturning a widely held myth about the genome and how it functions. 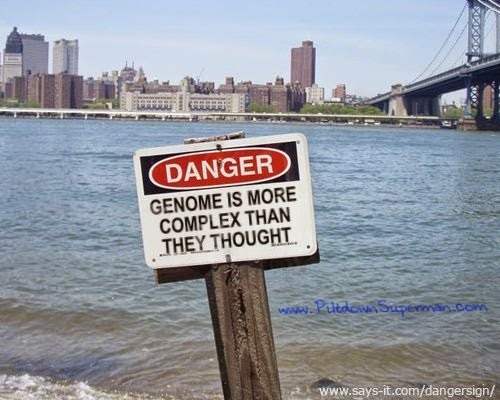 To read the rest, click on "Dual-Gene Codes Defy Evolution...Again". Are Long Ages Essential in Mineral Exploration? What's With All the Leafy Trees? So Where is That Creationist Research, Anyway? How Bad Is the Ebola Virus? The Bible and — ICEBERGS? Oceans of Water In Earth's Mantle? Use Caution!